The Brooklyn Bridge is a New York icon, much like a movie star: famous, spectacular, and stunning but sometimes just insanely busy. If you want to walk or run across a bridge just for the sheer fun of it without having to dodge crowds, try the nearby Manhattan Bridge from Brooklyn into Manhattan. It goes from the Flatbush Avenue Extension in downtown Brooklyn to Bowery and Canal Street in Chinatown in Manhattan, where you'll end up on a large plaza. This is near many subway stops if you'd rather ride back to Brooklyn or go somewhere else in Manhattan. The Manhattan Bridge, a suspension bridge finished in 1909, is a bit more than 6,000 feet long on the upper decks from portal to portal. It has seven lanes for cars, four for trains, a pedestrian walkway, and a bike lane. It was designed by Leon Moisseiff, who also was part of the team that designed the George Washington and Robert F. Kennedy bridges. The Manhattan Bridge has a pedestrian path, and where it ends in Manhattan's Chinatown neighborhood is some blocks north of where the Brooklyn Bridge hits Manhattan at City Hall. The Manhattan Bridge is usually much less crowded on weekends and holidays than the Brooklyn Bridge and is a great way to make your way into Chinatown. The walking path is on the south side of the Manhattan Bridge, and that's where the views are. Looking southward is where the New York magic is: the Statue of Liberty, New York Harbor, and the Brooklyn Bridge itself. It's spectacular to see the entire span of the Brooklyn Bridge against Lower Manhattan. The south walkway has been restored as part of the huge bridge rehabilitation project that began in 1982. The bike path is on the north side. The north-looking views are less remarkable than those you behold from the Brooklyn Bridge. The Manhattan Bridge is situated in such a way that on the north side even Manhattan's famous skyline looks, well, not quite so dramatic. It loses its over-the-top New York City style from this angle. 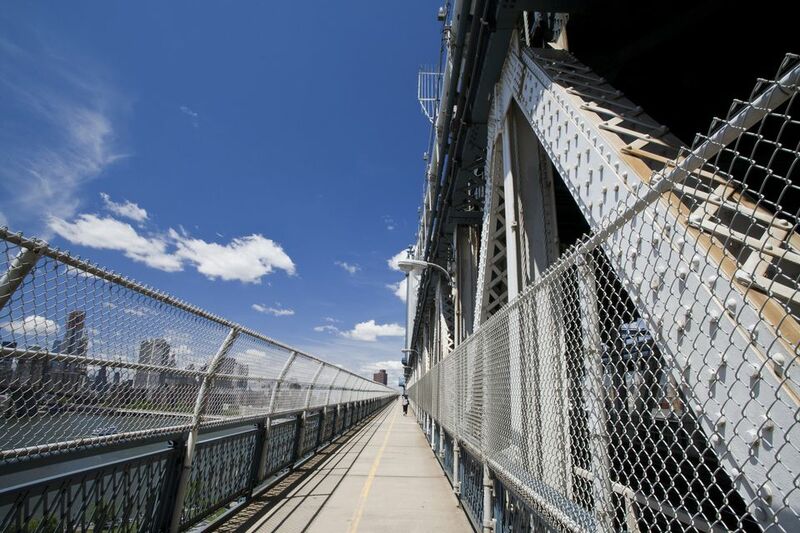 The experience of walking or jogging across the Manhattan Bridge depends on how much company you've got on the narrow pedestrian walkway, which is enclosed with a high fence on both sides. Unlike the Williamsburg Bridge, the pedestrian path on the Manhattan Bridge is narrow, and it's underneath, not above, the traffic. Be street smart: The Manhattan Bridge can be lonesome at off-peak hours. That said, runners and walkers headed to Chinatown or Soho or those who just can't be bothered with dodging the fast cyclists, gawking tourists, and other walkers on the Brooklyn Bridge might just prefer the Manhattan Bridge route. It's no-nonsense. And it gets you there. It's a choice bridge for many locals. Compared to the Brooklyn Bridge, the Manhattan Bridge offers joggers and walkers a grittier experience. Overhead subways rumble across the Manhattan Bridge, as well as cars.